The independent senator-elect is expected to align with them but insists he'll remain an independent voice. 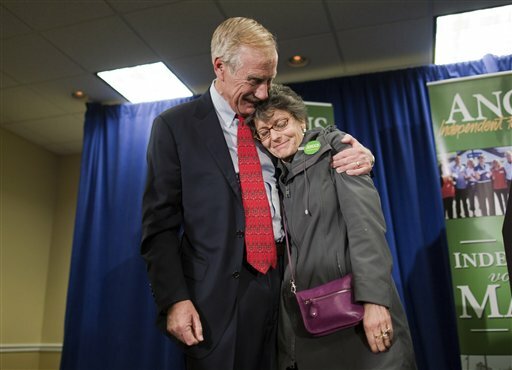 FREEPORT – The courtship of Angus King began even before the votes were counted Tuesday night. Senate Majority Leader Harry Reid, D-Nev., called to congratulate Maine’s new senator-elect and wasted no time inviting the politically independent freshman to form an alliance with Democrats. In fact, Reid told reporters Wednesday in Washington that he had spoken with King “on several occasions” during the past day. “We’ve had some very pleasant conversations and he is going to make a decision concerning what he is going to do,” Reid said. King said in a news conference Wednesday in Freeport that he will decide whether to align with Democrats or Republicans after a trip next week to Washington, D.C., to meet with key senators. Leaders of the two parties decide committee assignments, so even independents have to choose a side. As of late Wednesday, Republican leaders had not made their pitch to King. While he is widely expected to choose the Democrats, the subject is sure to come up in meetings with Republican leaders, too. No matter what he decides, King insisted Wednesday, he will be remain an independent voice in the highly partisan Senate. “I’m going to vote my conscience,” he said, his eyes red and voice gravelly after watching election returns late Tuesday and rising early Wednesday to thank shipyard workers at Bath Iron Works. King spent the day after his election doing media interviews and taking congratulatory calls, including one from President Obama. The 68-year-old former governor won Maine’s three-way U.S. Senate race with 53 percent of the vote, which he said Wednesday clearly shows that voters want an alternative to partisan gridlock. At the same time, however, he now must navigate his way into a culture that is tightly controlled by the two parties he campaigned against. “The fundamental dynamic of the Senate and House is party, and so a member who is outside the parties pretty much needs to make a home in one of the parties just as a way of making his or her way through the chamber,” said Cary Covington, associate professor of political science at the University of Iowa. King might have been in a strong bargaining position without such an alliance if the election ended up in an evenly split Senate and he got to determine which party has majority control. “If there was that kind of situation, there would be bidding war for King,” Covington said. Democrats won at least 54 of the 100 seats, however, which means the party does not need King to retain control of leadership posts and committees. His influence is diminished as a result, Covington said, although he still will be seen as a potentially important vote on divisive issues. King acknowledged on Wednesday that he would be going to Washington with a lot more clout if the parties had split the other Senate seats, 50-49. “If that was the case, there might be a thousand people in this room, from all over the country,” King joked at his news conference, which drew the Maine media but few or no national reporters. King said he hopes to serve on the powerful Finance Committee, but may have limited pull as a freshman senator without a party. King will be one of a dozen freshmen senators to be sworn in next year and one of three new faces representing New England. Harvard University professor Elizabeth Warren unseated Republican Sen. Scott Brown in Massachusetts, while Democratic Rep. Chris Murphy of Connecticut won the seat now held by retiring Sen. Joseph Lieberman, an independent who caucuses with the Democrats. Eight of the 12 freshmen are Democrats. King said Wednesday he will try to develop influence in the Senate by forming alliances with moderates from both parties, a group he said could become a powerful voting bloc that breaks through the partisan gridlock. King said some of his first calls in Washington also will be to former governors in the Senate, including several he worked with years ago. 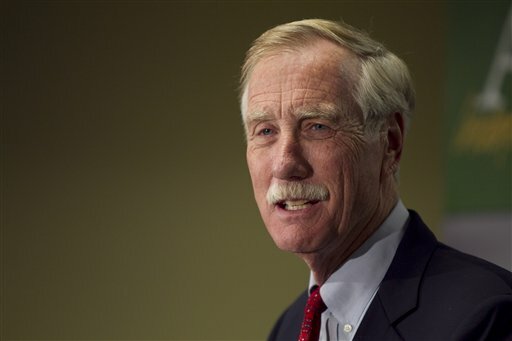 King’s tenure as Maine’s chief executive overlapped to some extent with the governorships of three Democratic senators, Jeanne Shaheen of New Hampshire, Mark Warner of Virginia and Tom Carper of Delware, as well as Republican senators John Hoeven of North Dakota and Mike Johanns of Nebraska. Warner and Johanns are also among a bipartisan group of eight senators whom King cited Wednesday as trying to come up with a compromise to avoid the looming “fiscal cliff,” a combination of tax increases and spending cuts that could take effect automatically on Jan. 1. King, a former Democrat who endorsed President Obama, has long been expected to caucus with Democrats in order to get assigned to working committees. Pro-Republican groups spent millions of dollars trying to defeat him and Democrats spent more than $400,000 to protect his lead. King said Reid did not make a hard sell in their phone conversation Tuesday night, but instead asked that King contact the Senate’s two sitting independents, Lieberman and Bernie Sanders of Vermont, to ask how Democrats have treated them. Both caucus with the Democrats. King said he planned to call both men. Sen. Susan Collins, R-Maine, also congratulated King by phone Tuesday night, but did not try to persuade him to align with the Republicans, she said. The state’s new senior senator plans to introduce King to colleagues next week, however. “I think it’s clear that Angus is very likely to caucus with the Democrats,” Collins said. But, she said, he could have real influence as one of a group of moderate senators who seek compromise and don’t necessarily follow their party leaders. “I believe he does have a potential to play a very important role among a group of us who are among the more moderate senators,” Collins said.